Due to its location, this detached holiday home with swimming pool is the perfect base for a wonderful holiday. 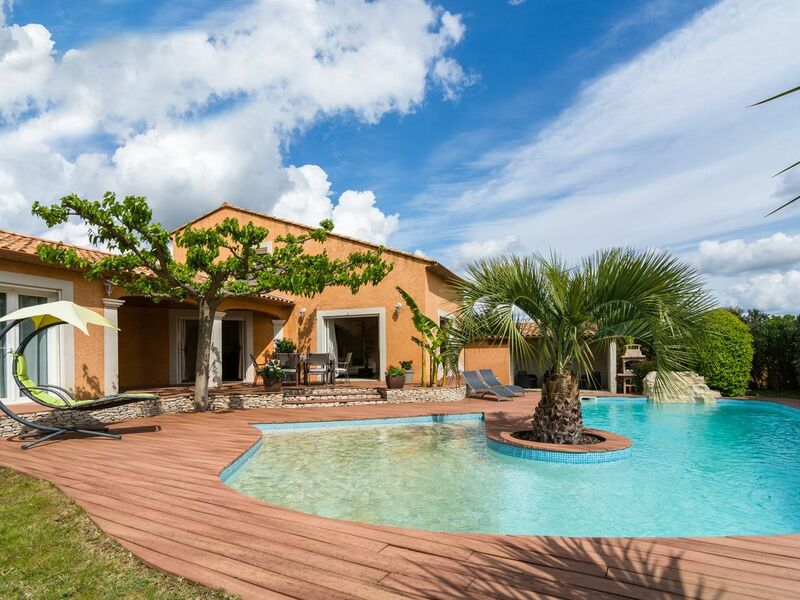 The villa is situated in a village just outside Nîmes with its famous Roman Arena (6km) and only 40 kilometers from the azure of the Mediterranean. The spacious holiday home has a pleasant decor. The kitchen is well equipped. In one of the bathrooms, dozens of air and hydro jets in the balneo bath provide the relaxation you need. Muscle aches and stiff joints will disappear like snow in the sun. From the bedrooms, you can walk through the doors directly into the fenced yard. And what a garden! There's a private free-form swimming pool and a real peninsula with palm tree. There's a covered terrace with lounge set, along with lounge chairs and a hammock chair. There's a BBQ at your disposal. Meet the rugged nature of the Camargue and its lakes, lagoons, marshes and dunes. This unspoilt area is home to pink flamingos, wild horses and bulls. Did you know that the Camargue also houses rice fields? Or visit the impressive Pont du Gard, near Nîmes. This piece of unsurpassed Roman architecture is on the UNESCO world heritage list. Prachtig zwembad, huis ruim en overal airco. Goede ligging t.o.v. Avignon, Uzes, Nimes, Arles, Montpellier. Strand op 45 minuten. Huis licht in rustige woonwijk. WiFi matig. INCROYABLE !!!! Wie zichzelf wil trakteren op een unieke vakantiesensatie moet deze villa gaan beleven. Prijs kwaliteit verhouding bij deze unieke gastheer en gastvrouw is sensationeel. Toto's en reviews geven een prima beeld, maar de werkelijke beleving is nog grootser. Dit huis is (over) compleet in alles. Dit moet je ervaren hebben !!!! Fam. Maas te Doorwerth. excellente malgré le temps maussade .